Having had the pleasure of seeing all three of these stellar musicians in many of their previous incarnations, I am genuinely looking forward to this late-summer tour. I have already gotten rave reviews of their east coast shows in Washington and Vermont. Trio! 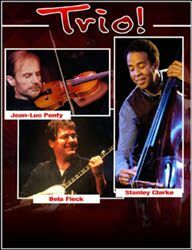 brings together the musical talents of the prodigious Stanley Clarke on bass, banjo virtuoso Bela Fleck, and the incredible French violinist Jean-Luc Ponty in a stunning genre-crossing collaboration. All three musicians are world renowned, critically acclaimed and award-winning performers and collaborators and this joint venture is an exciting exploration of their collective musical backgrounds. Stanley Clarke has many titles: bassist, composer, conductor, orchestrator, arranger, songwriter, producer, and recording artist. In a career that has spanned more than thirty years, he has explored new territory and redefined the role of the bass as more than just a rhythm instrument. He invented the piccolo and tenor bass and is a virtuoso on both electric and acoustic instruments. His legendary work with pianists Chick Corea and "Return to Forever", and later George Duke, have stood the test of time. Clarke has won many prestigious awards, including GrammysR and Emmys, has topped the charts and has sold enough records to earn multiple gold and platinum albums. Tracks such as "Lopsy Lu" and "School Days" have immortalized him in the Jazz world. He continues to work hard on his own recordings as well as scoring numerous film and television projects, such as Boyz 'N' The Hood, The Five heartbeats, and Pee Wee's Playhouse. Like his music, he remains a constantly evolving work in progress. Often considered the premiere banjo player in the world, Bela Fleck has virtually reinvented the image and sound of the banjo. His remarkable performing and recording career has taken him all over the musical map, both with his group Bela Fleck and the Flecktones, and on a range of solo projects and collaborations. He has been nominated for a Grammy award twenty times, has eight wins to his credit and has been nominated in more different categories than anyone in Grammy history. Genre-bending albums like Flight of the Cosmic Hippo, Tales From The Acoustic Planet, Outbound, and Perpetual Motion continue to demonstrate why he is a powerful and creative force in Bluegrass, Jazz, Pop, Rock, World Beat, and Classical music, and everrything else in between. Jean-Luc Ponty is a musical pioneer and the undisputed master of violin in jazz and rock. He is widely regarded as an innovator who has applied a visionary spin to his work and expanded the vocabulary of modern music. Born in France, the son of music teachers, he studied multiple instruments while growing up. He learned to play in the vibrant Parisian Jazz scene of the 1950s, where the violin was not necessarily an accepted modern Jazz instrument. As his talent and creativity became apparent, his notoriety grew. Over the last three and a half decades, he has toured the world many times over and worked with a variety of other musical greats, including Frank Zappa, (who added both the aforementioned George Duke and Ponty to his famed "Mothers on Invention" band, and helping secure Ponty's visa in the process! ), Elton John, Al DiMeola, Mahavishnu Orchestra, and more. His solo works, including Aurora, Imaginary Voyage, Enigmatic Ocean, Cosmic Messenger, and Tchokola, have been continual chart-toppers since the 1970s and Jean-Luc Ponty remains a vibrant creative force in the Jazz-Rock world. It doesn't get much tastier than this. Trio! will be performing at the Mountain Winery in Saratoga, August 19th, and at Yosemite's Strawberry Festival in September. Sounds even tastier now!